I have two personal email accounts. The first I nigh abandoned when about five years ago in college it became so inundated with spam that I panicked and started over. The experience was essentially the electronic mail version of Fastball’s 90’s hit “The Way.” I just took off and left it all behind me. It seems silly that email could cause so much anxiety that I would call it quits and get the heck outta Dodge — meaning that I even switched email platforms. Now that I’m a full-grown adult of 26, I know that when I have an overwhelming amount of unwanted dirty laundry piling up, I don’t just set the basket on fire so I can start my wardrobe over. I roll up my sleeves and get to work. I apply the same principles to unwanted emails. And with services like unroll.me, it’s easier than ever to clear out the clutter. Emails fight it out for survival like it’s the digital Hunger Games. My situation is not unique. It’s not even uncommon. As a Millennial, it pains me to admit that I am not special. As a marketer, it makes me curious: how can emails earn their place in my inbox? Just like with in-person interactions, a first impression is everything. If subscribers don’t find your first email valuable, it’s going to be even harder for you to convince them you’re worthy of a glance later on. Sharing valuable information (although not an overwhelming amount) will create an initial connection and leave an enduring positive impression. This is especially powerful if your welcome email isn’t conversion-focused. In most relationships, manners are important. And there’s a politeness about giving without any expectations which will reflect positively on your brand while distinguishing it from the immediately loud and direct ask of sales and discounts. You can offer a discount or some sort of coupon, but make sure it isn’t overpowering the “Welcome!” of the welcome email. Also, make sure to confirm content and frequency expectations for customers — let them know what they agreed to and can expect from you, and make it easy for them to adjust in a preference center if they wish. One of the best examples is from gaming accessories company KontrolFreek. Its team decided to develop a three-part triggered welcome series as one of the first automated campaigns, which we covered in a 2014 MarketingSherpa case study. Matt Konigsmark, Vice President of Marketing, KontrolFreek, described how the company wanted to increase lifetime value of customers by integrating them into “FreekNation,” what they call the company’s fan base, right from the get-go. The first email did start off with an offer for 10% off, because it was promised in the triggered email capture. It pairs that with a welcome to FreekNation, and a list of what the subscriber can expect to receive. Also, it places culture-specific creatives and clickthroughs to four of KontrolFreeks best-selling products, as well as links encouraging them to engage further on social media. Remind the customer why they opted-in to your list by showing personality, or deliver them valuable content that will do it for you. This is probably most vital in the welcome series when customers are forming their first expectations, but should be prevalent throughout each and every send. 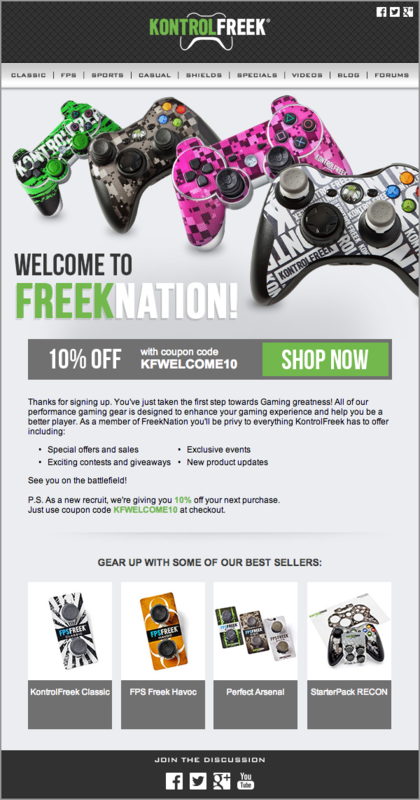 With KontrolFreek’s welcome series, two days after the initial email, the second email in the series goes out with the headline “About KontrolFreek,” which introduces the brand further. It reiterates the 10% off offer from the first email, but this email is “really about the product benefits and the science. If you’re new to our products, there’s a real science behind our stuff that is compelling, and we love to get that message out,” Matt said. “Word-of-mouth is very important for us. We do a lot of business based on word-of-mouth and social sharing,” Matt said in describing the objective of the third email. Five days after signing up, the third email is sent. The headline reads “Better Gaming or Your Money Back,” and it describes the company’s policy on returning gaming gear with no questions asked within 30 days. Its main goal, however, is to further encourage the new subscriber to interact as part of the “FreekNation” community online by following the brand on Twitter or Facebook. The email reiterates the 10% off coupon code, reminding them “Don’t forget!” but most importantly, it then offers, “What our fans are saying” and displays four fan videos. Valuable content in the form of the “FPS Freek Comparison Guide,” “Controller Compatibility Guide” and “Our Forums” are linked to last in this email. The marketing team wanted to start building brand loyalty early, and the objective of this series was not solely to get the one welcome email sale out of a customer — it’s to bring people into the community and “join the club, look at the science,” Matt said. 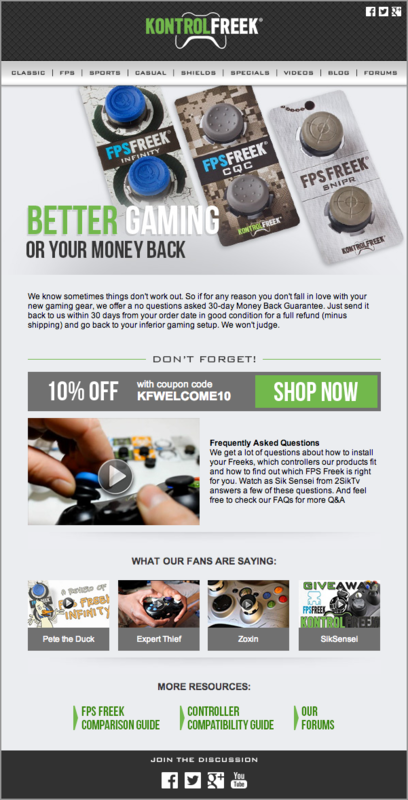 The welcome series alone drove a total of 33% of email revenue for KontrolFreek, which equaled 4.4% of company revenue. It had an overall open rate of 30%, and the on-site conversion rate for those coming through the emails was 24%. They had a 6.5% purchase percentage, which Matt remarked was more than twice what the team normally sees from a typical product email. The takeaway from all these numbers? Distinguish yourself in the introduction. An email subscription is like any relationship — start the way you want to finish. Give them quality interaction, and they will respond in kind. For more insights, I also interviewed Ashish Mistry, President and CEO, KontrolFreek, on this campaign in the Media Center at IRCE 2015.